In the past, I have written about ways to integrate SiteCatalyst with other tools including Voice of Customer, CRM, etc… In this post, I will discuss how SiteCatalyst can be integrated with Tealeaf and how to implement the integration. This post was inspired and co-written by my friend Ryan Ekins who used to work at Omniture and now works at Tealeaf. For those of you unfamiliar with Tealeaf, it is a software product in the Customer Experience Management space. One key feature that I will highlight in this post is that Tealeaf customers can use their set of products to record every minute detail that happens on the website and are then able to “replay” sessions at a later time to see how website visitors interacted with the website. While this “session replay” feature is just a portion of what you can do in Tealeaf, for the purposes of this post, that is the only feature I will focus on. In general, Tealeaf collects all data that is passed between the browser and the web/application servers, so when someone says, “Tealeaf collects everything” that is just about right. While there is some third party data that may need to be passed over in another way, for the most part, out of the box you get all communications between browser and server. Tealeaf clients use their products to improve the user experience, identify fraud or to simply learn how visitors use the website. Whereas tools like SiteCatalyst are primarily meant to look at aggregated trends in website data, Tealeaf is built to analyze data at the lowest possible level – the session. However, one of the challenges with having this much data, is that sometimes finding exactly what you are looking for is like looking for a needle in a haystack if you have an earlier version of Tealeaf (i.e. earlier than 8.x). While the Tealeaf UI has gotten better over the years and is used by business and technical users, it was not built to replace the need for a web analytical package. It is for this reason that an integration with web analytical packages such as SiteCatalyst makes so much sense. It is easy to see how simply passing a unique Tealeaf session ID to a SiteCatalyst variable can establish a powerful connection between the two tools that can be exploited in many interesting ways. The above example is the primary method of leveraging the integration, but you could also upload meta-data from Tealeaf into SiteCatalyst using SAINT Classifications and many, many more. 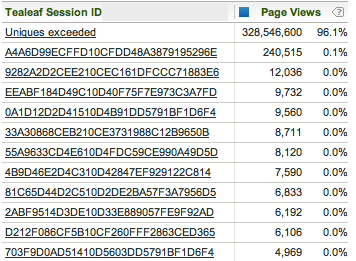 One additional point to keep in mind is that for many clients, the number of unique Tealeaf session ID’s stored in SiteCatalyst will exceed the 500,000 monthly limit. As shown in the screenshot above, 96% of the values exceeded the monthly limit. This means that you may have to rely heavily on DataWarehouse, which can sometimes take a day or two to get data back. It also means that you may want to consider using an sProp instead of an eVar if you have a heavily trafficked site. So there you have it. If you have both SiteCatalyst and Tealeaf, I recommend that you check-out this integration and think about the use cases that might make sense for you. Also keep in mind that similar integrations exist with other vendors that offer “session replay” features like ClickTale and RobotReplay (now part of Foresee). If you have any detailed questions about the Tealeaf integration, feel free to reach out to @solanalytics. You mention the use if Datawarehouse due to the 500,000 limit in SiteCatalyst and this does indeed create a lag in the time to retrieve this data. To alleviate this, businesses should take advantage of not only SiteCatalyst but also AdobeInsight. This has no 500,000 limit and the data would be available only 24 hours later, not a couple of days. Dave – That is true, but most companies cannot afford a product like AdobeInsight which has a significant price tag!! Good stuff! We are currently capturing this but haven’t yet gotten to viewing the unconverted sessions. We do not use the Genesis integration, however, but simply use the SiteCatalyst s.c_r function to read the Tealeaf cookie and fetch the Tealeaf session ID. Taking it a couple steps further, we also rely on the Tealeaf ID to set the transaction ID on lead capture and pass the same ID as a custom field into SalesForce. The system has worked very well for us, as now we’re able to upload the CRM data back into SiteCatalyst despite longer sales cycles. TLSID has become our primary key for just about all activity! Another integration we’ve done is passing the Tealeaf ID into LivePerson when a call is initiated. Eventually, we’ll have the LivePerson/SF integration set up to pass the ID into SalesForce and complete the string. It’ll be glorious!